Featured, from left: Dr. Carlos Margo, Associate Dean, Office of Industry Training and Economic Development, South Texas College; Paul Rodríguez, Chairman, Board of Trustees, South Texas College; McAllen Mayor Jim Darling; Dr. Shirley E. Reed, President, South Texas College; and McAllen City Commissioner Joaquín “J.J.” Zamora, on Thursday, December 6, 2018. The McAllen Economic Development Corporation on that date presented STC with a $259,440 job-training grant to provide customized education related to advanced manufacturing within the city’s boundaries. McAllen city leaders are being encouraged to monitor the public Twitter account of Gov. Greg Abbott, who is an avid user of that social media format, and report to the public on statements by the state’s top leader which have a direct impact on residents of the second-most populous city in the Rio Grande Valley. Abbott has powerful use of his website (https://gov.texas.gov) to publicize his activities and legislative priorities, along with his proven track record of traveling statewide to help get his messages and priorities to the public. But if various statewide news accounts are correct, the governor is much more likely to first express his legislative and political views through the use of Twitter, and it is those more immediate statements by the governor that merit close monitoring, Darling contends. In addition to reading Abbott’s Twitter postings, Darling said he wants his fellow members of the McAllen City Commission to take more prominent roles in the 86th Texas Legislature, which began its 140-day regular session on Tuesday, January 8, 2019. “I would like to see us get more involved in the legislative session, and hopefully, also from a standpoint of getting the (McAllen) Chamber (of Commerce) and citizens involved, writing our Legislature,” the mayor recommended. Darling wants his constituents to help break the stereotype that citizens statewide don’t get involved in the Texas Legislature, especially on the distribution of the state’s two-year budget, which in 2017 involved $217 billion. Darling, who said he is receiving weekly reports on state legislative updates, reminded area residents that in a matter of days, many Texas lawmakers will be touring the Rio Grande Valley to learn more about the region and its legislative concerns. From Thursday, January 24, through Sunday, January 27, 2019, the Rio Grande Valley Partnership will be hosting “a four-day legislative tour to highlight the unique challenges and opportunities of our region,” according to sponsorship request co-authored by Danny Gurwitz, Chair of the RGV Partnership, and Sergio Contreras, CEO of the RGV Partnership. “We invite and host our State Legislators while we provide educational information from across the Rio Grande Valley. The 4-day tour of the RGV will focus on various sectors, such as: education, infrastructure, transportation, health care, agriculture, international relations, and business and commerce,” their joint announcement noted. On a more local level, the Governmental Affairs Council of the McAllen Chamber of Commerce has announced that Darling will be detailing the city’s state legislative agenda on Wednesday, January 30, 2019, from noon to 1 p.m. The event will the place in the McAllen Chamber of Commerce headquarters, located at 1200 Ash Avenue. Area residents who wish to receive more information about attending Darling’s presentation may contact Gerry García, Vice President of Special Projects & Government Affairs for the McAllen Chamber of Commerce, at (956)682-2871. 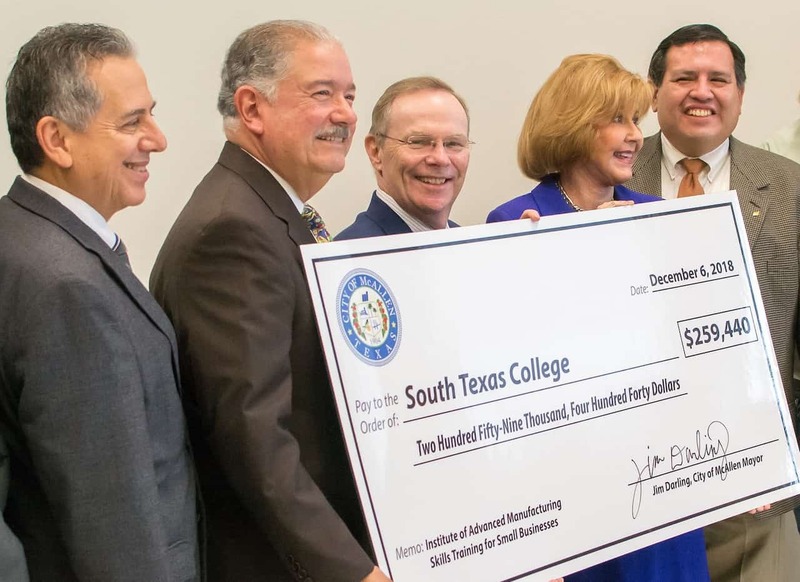 The McAllen Economic Development Corporation on Thursday, December 6, 2018, presented South Texas College with a job-training grant to provide customized training related to advanced manufacturing within the city’s boundaries. Contributing to the training of companies is a game changer, Darling said as the city’s development corporation presented STC with a $259,440 job-training grant to provide customized training related to advanced manufacturing for companies located within the city limits. The funding period for the grant is from October 1, 2018 to September 30, 2019 and will include equipment, salaries and supplies provided by STC’s Institute for Advanced Manufacturing (IAM) based at the college’s Technology Campus. “As I listen to the various speakers talk about how critical this workforce development is to the economic future of our region, it makes me feel real good because this is why the institution was created,” said STC President Dr. Shirley A. Reed. “When you look back, the premise was so basic and so simple. If you are going to grow an economy and get people out of poverty, you need jobs. But how are you going to get jobs if you don’t have a skilled workforce? Speakers at the check presentation along with Reed and Darling included Paul Rodriguez, Chairman, Board of Trustees, South Texas College; Ken Shaffer, Operations Manager, Regal Ken; Dan Robinson, Plant Manager, Grand Rapids Foam Technologies; and Keith Patridge, CEO, McAllen Economic Development Corporation. IAM at STC specializes in building a manufacturing workforce through quality-customized training, which involves more than 300 courses at STC that have been tailored for the needs of local industry. José Gómez contributed to this article. For more on this and other Texas legislative news stories which affect the Rio Grande Valley metropolitan region, please log on to Titans of the Texas Legislature (TitansoftheTexasLegislature.com).